Few buildings have been disabled, so the playability will be a bit harder than always. Notes:This is an unbalanced map which is best played 1 VS 4. Of course, You can play any way You want. The lower position in the middle is by far the toughest and created for a human player due to the very limited space and resources. The playability should have no problems so choose any lords You want. I am looking forward to it, i am almost done playing your invasion. The balance was perfect i played the map as you(az)had instructed to do and the map was very well balanced.I first thought that i had a lot of resources to use but i was wrong so i had a bit hard time with the map but it was perfectly balanced. If i was the maker of this map i would just make a star and leave it there but here you have put up a fountain which was very creative and the star design was very creative with its different layers.The resources had been put up creatively blending iron and stone. 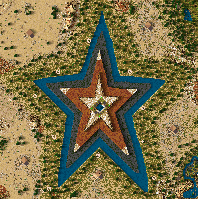 Map design was the best aspect of the map as the star is the center of attraction in the map and the star is almost symmetrical.This is a very hard thing to achieve from my view.Very well done.The terrain was done perfectly distributing all resouces in a natural manner. The story was brief descriptive and long enough. Every sentence is interesting. You have used html and banners to make it look interesting too! So a 5.0 is issuable. I like the story a lot! I wanted to spend all day playing this map. I loved the difficulty in this map. I made it 2v2v1 with AI advantage. Even with them fighting each other, I still had to restart a few times. I had a great time playing. The map was balanced as far as balance goes. The map had the harmony a map needs in order to be sucessful. Creativity is what this map is about. You made the map a huge star! The star looks great, you made a amazing fountain, and made it even at that. This map is what creativity is about. editors. You did a excellent job as far as this goes. The story had me reading to the last period! It was enjoyable and understandable, which makes it superior to the norm. You pulled off all the stops on this part and blew me away. Excellent job! Many thanks for the rating. The playability of this map was tested multitude times to make it a good 1 vs 4 skirmish with a hard level. I am very satisfied that you liked the design and the whole idea of the work. Thank you for playing my map. You can change the color with the help of hexademical editor or just download the template maps which are in the utility section. The walls are made by using the rock-add-to-wall trick when you place the rock on the wall; it levels (Lowers) the stone structure. A lot of eyecandie maps hold this trick. You should try downloading the editor trick manual , it's in the utility programs sections. You can download eyecandy maps, to gain some ideas using this trick.